2012 Miss Chinese International beauty queen Kelly Cheung (張曦雯), who turned 28 years old in May, has had a couple of known pursuers since her debut. About two years ago, the 5’9” beauty was revealed to be dating businessman and wealthy heir Daniel Lilischkies, but later split. It’s always been known that Kelly leads a frugal lifestyle, but the paps have discovered a complete 180-degree change in the TVB star. 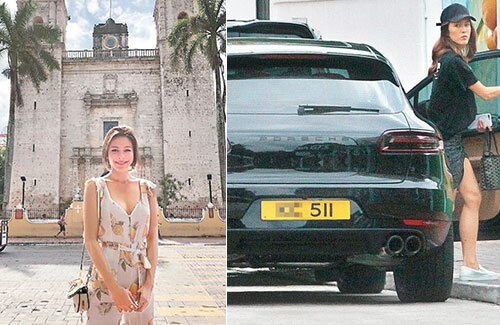 They noticed that she recently purchased a new Porsche, which has the license plate number “511”—the digits of her birthday. She has been out traveling overseas all month—after visiting her friends and family in America, she traveled to Mexico for a break. Last month, Kelly was seen enjoying a luxury spa day with her mother. Paparazzi followed Kelly driving around the city to meet up with friends; one night, they spotted her having dinner with TVB stars Yeung Chiu-hoi (楊潮凱), Stephen Wong (黃嘉樂), Zoie Tam (譚凱琪), and other friends. Yeung Chiu-hoi helped Kelly spot her car as she attempted to parallel park her Porsche by the streets. They did not leave dinner until midnight.